Blueberries in general are all self pollinating, but produce a better crop if you have more than one variety. A great blueberry plant for cold-weather climates. This cold-hardy bush produces big clusters of large all-purpose berries — perfect in salads or pies, or served with cream. Ripens in July. Self-pollinating, but will yield larger crops if pollinated with Jersey or Earliblue. Mid-season highbush. Long, rather tight, grape-like clusters. Vigorous, moderately spreading 4-6' bush. Medium to large, firm, light blue berry. Highly flavored. Exceptional fall color. A hardy, healthy blueberry. Enjoy abundant crops of large, crack-resistant, light blue berries. Cold-hardy. Ripens in August. Self-pollinating, but will yield larger crops if pollinated with Bluecrop or Earliblue. The annual harvest of North American blueberries would cover a four lane highway from Chicago to New York if spread out in a single layer. American poet, Robert Frost, loved blueberries so he wrote a poem about them. You guessed it; the poem was called "Blueberries". Clusters of dainty, waxy, bell-shaped, white flowers bloom in spring. 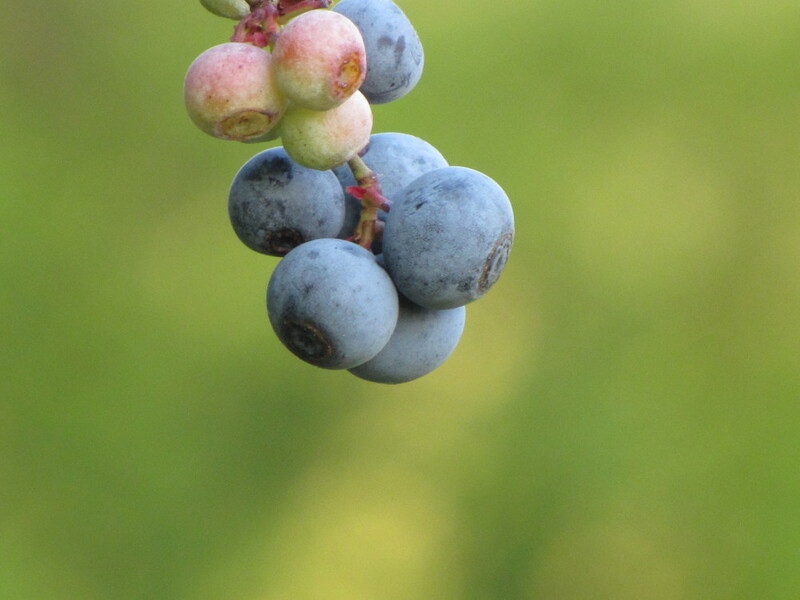 Flowers are followed by tasty blue berries, which ripen in summer. The fruit is a favorite among humans as well as birds, small mammals and box turtles. 'Northland' has bright green leaves that turn orange in fall. It is also well adapted to a variety of growing conditions. Reddish stems can be attractive in winter. Quarter-size berries! This variety is big and bountiful — the largest early-season blueberry. The fruit has an outstanding flavor and is super-hardy. As a landscape bonus, the plant features snowy blossoms in early summer and stunning orange leaves in fall. Cold-hardy. Ripens in June. Self-pollinating, but will yield larger crops if you plant two or more. Reka was selected and developed in New Zealand. It is vigorous, fast-growing, and adapts well to a wide range of Northern climates and soil types. Gardeners will marvel at Reka's bountiful yields of early-ripening, medium-sized, exceptional-tasting berries. Burgundy red fall color is an added landscape bonus! Blue-green foliage and showy pink to white flowers provide ornamental value, followed by an abundant crop of fruit. Self fruitful, but yields best when planted with another variety. Large, light blue berries are firm with an excellent flavor. Fruit set ripens midseason. 'Berkeley' is a late midseason blueberry and carries attractive powder blue fruit with a pleasing light flavor and good dessert quality. 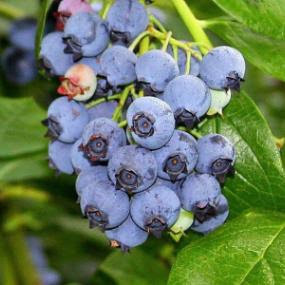 Blueberry 'Berkeley' is the most popular home garden varieties. Berkeley' is a late midseason blueberry and carries attractive powder blue fruit with a pleasing light flavor and good dessert quality. Blueberry 'Berkeley' is the most popular home garden varieties. #1: Bladder Aid | Blueberries, like cranberries, contain compounds that prevent bacteria from adhering to bladder walls, which helps ward off urinary-tract infections (UTI’s), according to a Rutgers University study. #2: Brain Power | With increasing age, brain power also decreases which causes short term memory loss and other symptoms like this. Blueberries containing antioxidants are helpful in curing these types of diseases and help in motor skills. It was first examined in animals and a positive result was found which showed the increase in motor skills and learning. #3: Anti-Aging | As we know antioxidants are the cure against anti-aging. Blueberries are rich in antioxidants which slows down the aging effect on your skin. These antioxidants stops cells from damaging and prevent inflammation which is the main cause of anti-aging. This nutritional benefit of blueberries is used by cosmetic companies for making beauty products. #4: Slim Figure | Blueberries contain Vitamin C and fiber with 84 calories of energy which is sufficient for body’s daily intake percentage of Vitamin C. It is a low calorie fruit which is more nutritious, giving you zero fat and a good meal with fiber intake. #5: Blood Cells | Blueberries contain minerals like potassium, manganese, copper, iron and zinc which help control heart rate and blood pressure levels. Copper is required for the production of red blood cells. Iron is required for red blood cell formation. Thank you James at Food Reference for the following information! The U.S. is the world’s largest producer of blueberries, harvesting a total of 564.4 million pounds of cultivated and wild blueberries in 2012. More than 473.3 million pounds of cultivated blueberries were harvested, and about 60 percent were sold as fresh blueberries. Maine is the leading produces of 'wild' or lowbush blueberies, harvesting 91.1 million pounds in 2012. 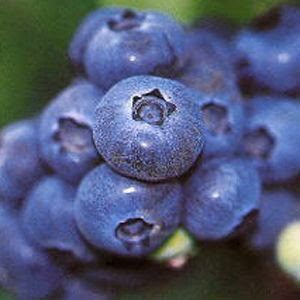 Michigan is the leading producer of cultivated blueberies, harvesting 87 million pounds in 2012. Other top producing states included Georgia, Oregon, Washington and New Jersey. Cultivated blueberries are also grown in Alabama, Arkansas, California, Florida, Indiana, Mississippi, New York and North Carolina. 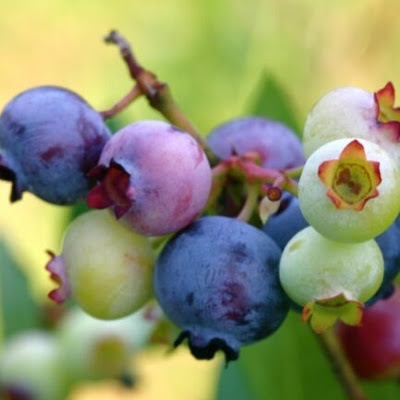 The Blueberry (Genus Vaccinium) was designated as the Official Blue Berry of North Carolina in 2001. Did you know.....that early American colonists made grey paint by boiling blueberries in milk. The blue paint used to paint woodwork in Shaker houses was made from sage blossoms, indigo and blueberry skins, mixed in milk. If all the blueberries grown in North America in one year were spread out in a single layer, they would cover a four-lane highway that stretched from New York to Chicago. Blueberries and huckleberries although related, are not the same. One obvious difference is that the blueberry has many soft, tiny almost unnoticeable seeds, while the huckleberry has ten larger, hard seeds. Blueberries are also more blue, while huckleberries are blackish blue or redish black. This red/black variety is also called southern cranberry. Blueberries have been commercially cultivated only since the early 20th century, when the USDA helped develop new improved varieties. Blueberries contain significant quantities of both antibacterial and antiviral compounds, and have a reputation in northern Europe of fighting infections.They may also help protect against heart disease. The blueberry is the official berry of Nova Scotia. In 1991 Maine designated the Wild Blueberry as the Official State Berry. New Jersey designated the Highbush Blueberry (Vaccinium corymbosum) as its Official State Fruit in 2004. North America produces nearly 90% of world blueberry production (2005). Wild blueberries are grown on 60,000 acres in Maine, and 99% of this wild blueberry crop is frozen. (Although some of these are later canned).